CHICAGO – About 200 hospitality workers and supporters were arrested here Sept. 24 as part of a civil disobedience action in the streets outside the Hyatt Hotel and corporate headquarters. Those who participated in the sit-in, blocking rush hour traffic for more than an hour, were cheered on by almost 1,000 demonstrators who jammed the sidewalks in front of and across the street from the hotel. All those arrested were bussed to a special police facility where they were given citations and released. The largest civil disobedience action by workers here in many years came less than a year after other workers in Chicago made history last winter by occupying a window and door factory after the owner shut it down. 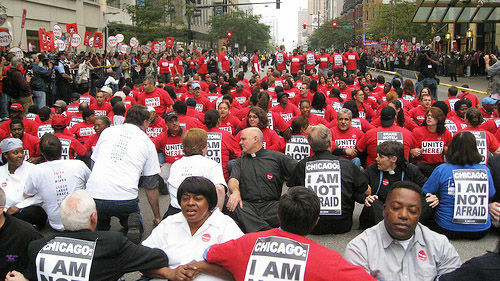 The sit-in was organized by Unite Here Local 1, the union that represents 15,000 hotel and food service workers in Chicago and casino workers in Northwest Indiana. The action came amid escalating labor disputes with Chicago hotels and growing public backlash against Hyatt hotels for the recent firing of 100 housekeepers in Boston. Unite Here Local 1 is in contract negotiations with hotel employers, including the Hyatt. Their contract expired Aug. 31. Massachusetts Gov. Deval Patrick confirmed Sept. 25 that he has ordered state employees to stop doing business with Hyatt hotels until it rehires the fired workers. Hyatt fired the workers and brought in lower-paid replacements the laid-off workers had trained. Reflecting the national nature of the outrage, 92 hotel workers in San Francisco were arrested in a simultaneous civil disobedience action, also on Sept. 24. The protests capped months of anger in the ranks of hotel workers here and around the country who are criticizing their employers for driving down wages, increasing workloads, cutting health benefits and jobs. Cheers and applause broke out from the crowds of supporters lining Chicago Ave. every time another dozen or so workers, wearing their uniforms and placards reading “I Am Not Afraid,” moved into the street, linked arms and sat down. Among those arrested were community leaders including Chicago Alderman Ricardo Munoz and Jane Ramsey, executive director of the Jewish Council on Urban Affairs. “These men and women wash your plates and make your beds. They are our brothers and sisters,” Munoz said as he sat down in the middle of the street. Despite the urgency of their own struggles on the job here, almost everyone expressed support for the workers in Boston. In that city, on August 31, Hyatt fired the housekeepers (all women) and replaced them with low wage workers from a contractor in Georgia after telling the women they were training “vacation” replacements. Angela Norena, a fired housekeeper at a Boston Hyatt told the World, “You cannot imagine how bad they were to us. 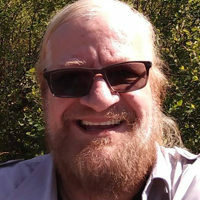 I came to America 21 years ago and for all those years worked my fingers to the bone for them here in the land of opportunity. Earlier in the day Norena joined a delegation of women working in Chicago hotels in an appeal to Hyatt owner Penny Pritzker, who was giving a talk at the Sheraton Chicago, to bring back the “Hyatt 100” housekeepers in Boston. Hyatt, which made $1.3 billion in profits from 2004 to 2008, is 85 percent owned by Chicago’s Pritzker family. Pritzker was at the Sheraton Sept. 24 addressing a conference of the National Center for the Seniors Housing and Care Industry.